It seems like winter has overstayed and it is time to say farewell and to welcome spring since it is already approaching. 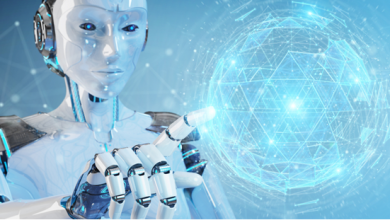 Spring seems to be the most devalued season in the year, for people are usually excited for the hot days of summer, or Christmas in winter, or Halloween in fall, but, unfortunately, spring does not seem to be getting the same attention and eagerness. However, spring is the only season when you get to enjoy a warm weather and a wide range of fashionable attires. For these reasons, it is hard to find people who do not like this time of the year though not everyone seems to talk a lot about it. Well, it is still not a vacation time; people have to go to work, but they might be more confused during this season, for they are not sure what exactly to wear to their workplace. Here, in this article, we will help people love spring more than ever and look forward to it, so they can get to pick up new styles and attires, besides; your workplace should not necessarily be somewhere that you hate going to or go just to make a living; instead, you might perceive it as a place where you get to meet your colleagues, have fun, and create the best memories of your life. Well, according to the science of psychology, in order for you to enjoy your time and spend amazing moments, you need to feel good and confident enough and one of the easiest and simplest ways that would help you feel so is to dress fashionable. They always say that when you look good, you feel good, and this is definitely true; all you need to do is to put this saying into action and see the results by yourself. Besides, part of creating amazing memories is taking snaps and pictures of yourself as well as your work mates altogether, so it would be great if you are always looking good and be ready for that moment. 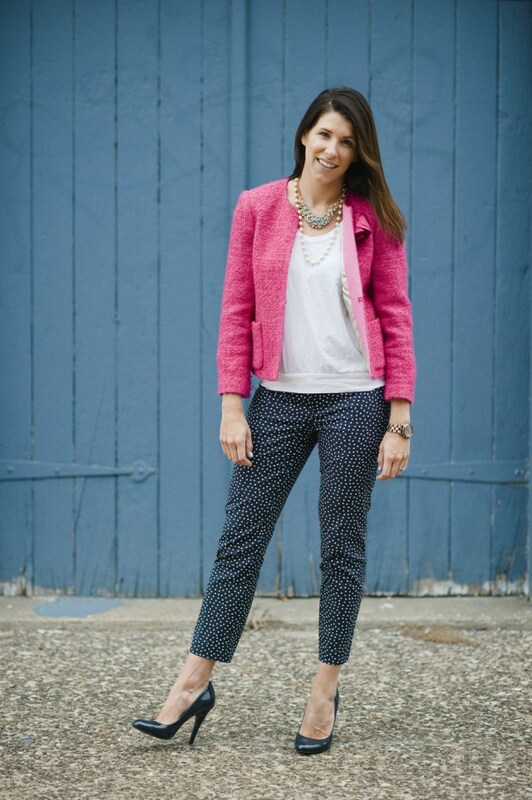 In this article, you will be introduced to 15 different styles from which you can pick up what suits you the best and rock your style at work. Well, this is the best part about spring; the weather might be warm, but it still has that cool breeze, so this amazing combination gives you the chance to mix between cool summer outfits and elegant winter ones. 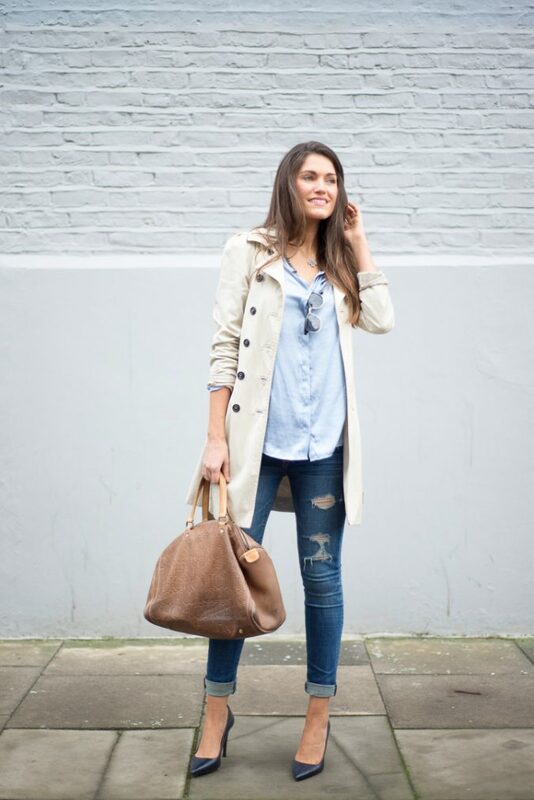 You do not have to hate the whole week and just look forward to the weekends; you can break that negative feeling by putting on an elegant trench of a light in color along with a pair of ankle jeans. For the footwear, you can either go with a pair of flats or grandma heels; either way, they will both rock your entire outfit. This is one more amazing outfit that is suitable for a workplace and you should definitely experiment it; the Canadian Tuxedo. In case you are not really familiar with what the Canadian tuxedo is; it is a style that consists of two denim pieces, on top as well as the bottom, but because it would look like you are wearing too much denim, so the look is broken up with an elegant blazer. You will look fabulous in that stylish tuxedo. There are some workplaces where there is a dress code and jeans are not allowed. 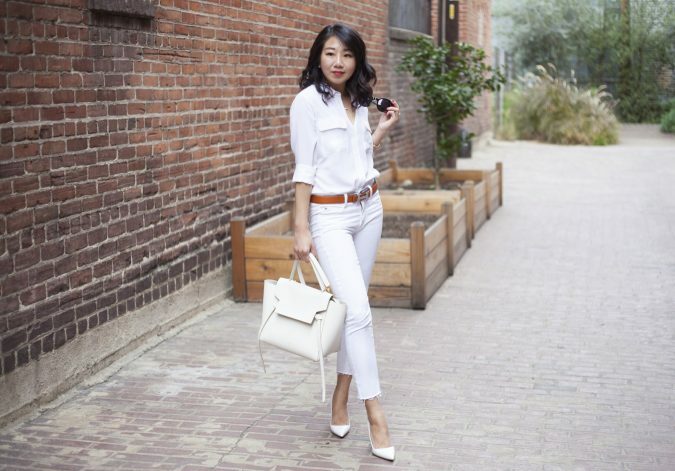 Sure, we get that, but you can try dabbling into a pair of white jeans instead of a normal one, especially, because it does not look that casual if it is paired with an elegant button-down or a blank blouse; besides, it goes perfectly with this amazing warm season. 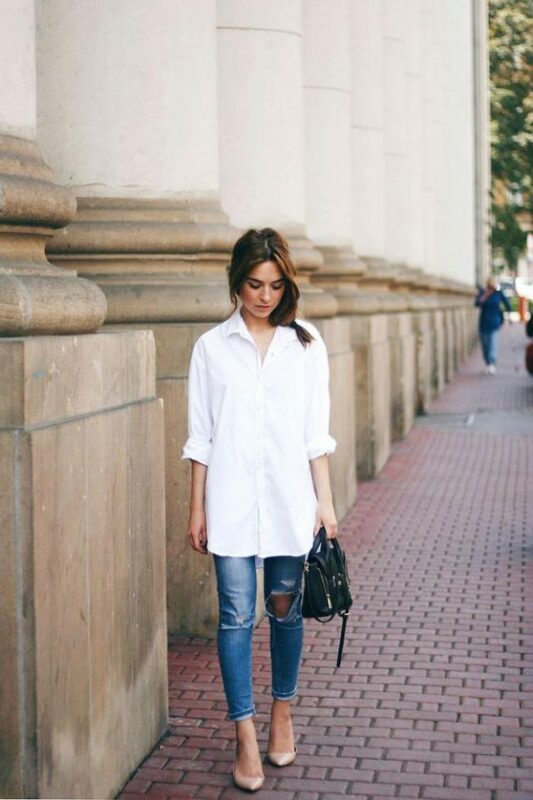 If you are afraid of creating a casual look, then put on a pair of heels and your whole outfit will be on point. All you got to do is to create a new looking style by playing up with the ordinary styles you already have. 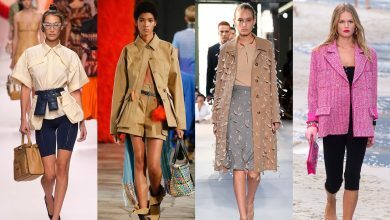 We already know that jackets are amazing fashion pieces, for they work both ways; warming you up and revamping your style, but they should not be the only thing you resort to for creating a fashionable look; instead, you can try dabbling into the layering style by putting on a delightful button-down shirt underneath an elegant dress that is perfect for spring. 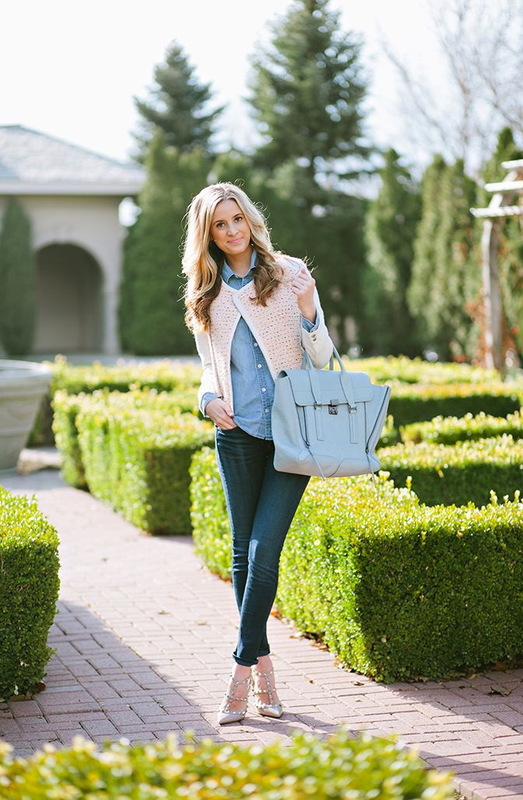 People usually tend to believe that a pair of boyfriend jeans will create a casual style while the ripped ones create that hipster style and, at that point, we will have to agree because that is completely true, but as we already stated before; you can play up with the ordinary styles you have and create a new one that is suitable for a workplace. Well, the ripped boyfriend jeans fall in that category too; they can look great for a workplace if you try combining them with a pair of bright heels along with a sheer blouse. 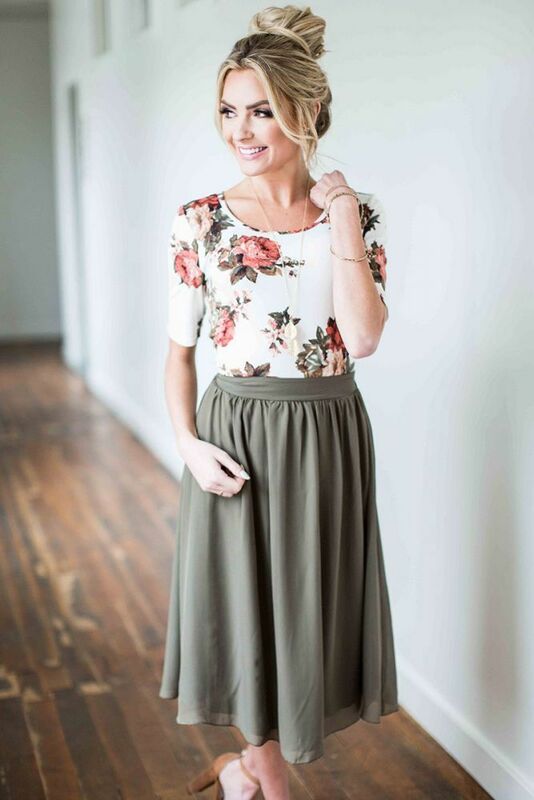 Again, we will actually stress over the fact that layering creates a nice professional look, but this time, try pairing a sweater with a shirt and put on an elegant black skirt. Since these accessories usually rev up any look, then it would not hurt to wear a cool hat to create a nice outfit for work. We have already stated that black skirts are a great choice for a work outfit, but actually, a black leather one goes a long way. Put on a black leather skirt and pair it with a black top and, because black is one of the colors known to create an elegant look, you will look incredibly fabulous. Can you imagine how adorable this outfit is going to look on you? 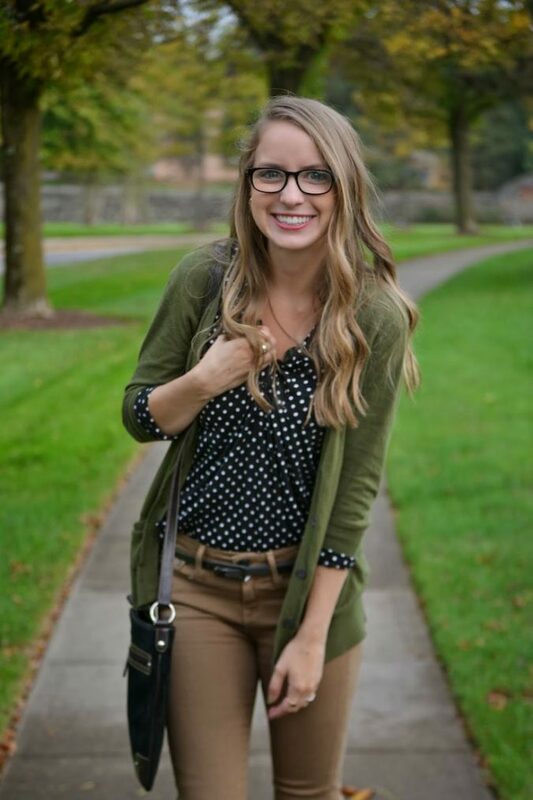 First, we should agree on that fact that green is an amazing color to be chosen for spring, so putting on a pair of green pants that have adorable polka dots scattered everywhere will look fantastic for a perfect spring work outfit. Putting on a collared shirt along with a Cardigan on top will, definitely, look fabulous, especially if it is paired up with Straight Pants; and if you would love to add more style to your overall appearance then go ahead and wear either a scarf or a statement necklace. 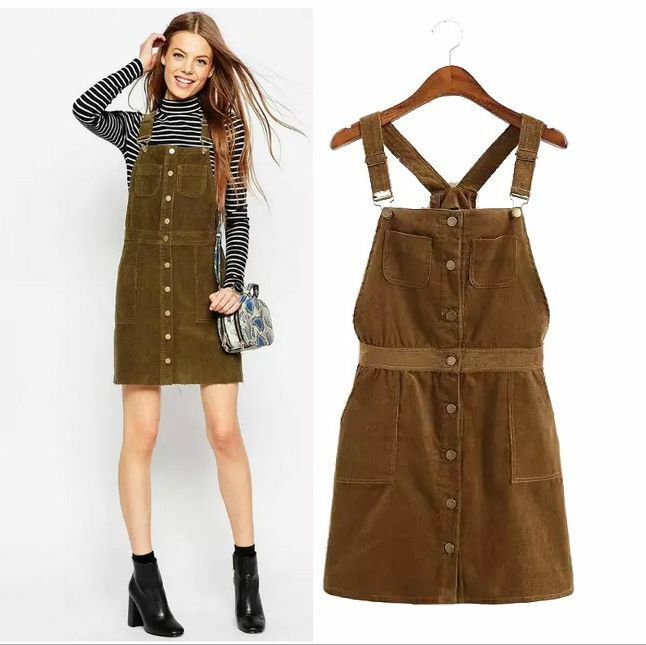 This outfit will create the good appearance that you are striving for; besides, everyone will not help but praise you on how good looking you are, so your confidence will be certainly boosted up and that is exactly what you need for surviving one of the boring days at work. We are all on the same page when it comes to discussing how elegant the dark shades are, but when it is spring time then it is actually better if you add more colors instead. 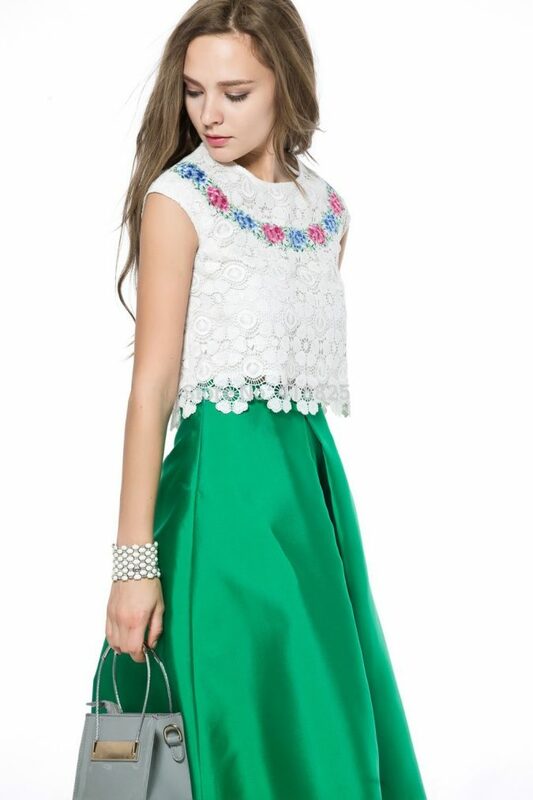 Put on a nice green skirt along with a floral top because what could actually create a better outfit for spring other than a colorful one paired with some adorable flowers. Try wearing this outfit and you will definitely look gorgeous. Of course, formal style is the easiest outfit to retreat to when you are confused what you should wear and it is always a good idea because guess what? It will never disappoint you; however, since it is spring, you do not really have to look that serious, so you can break the outfit with an adorable pink coat or any other jacket of your chosen color. You do not always have to go for wool and cotton pants, you can actually revamp your style by experiencing the fabulous look of the leather pants. This incredible pair of pants promises to grant you a stylish appearance. Well, people usually tend to mix between big volumes and skinny or tight outfits. For example, if you are wearing a pair of wide-leg pants then you are more likely to wear a tight top while if you are wearing a pair of skinny pants, you tend to go to oversized tops. Yes, that is exactly how it works, but that does not mean that you cannot play with the proportions and break the rules; you will still look as fabulous if you try going for big volumes for both the top and the bottom. We guarantee that you definitely are not going to be disappointed with that on-point outfit. For hundred and thousand times, we will forever keep stressing on how stylish and fabulous denim is. Well, for creating an incredibly stylish outlook put on a pair of dark denim and we absolutely know that whatever you will choose to put on along with it is going to rock your appearance, but for a killer style, throw a sheer blouse along with your dark denim and you will look like a working diva with the least effort ever exerted. Your white shirt is definitely known to be your savior; it saves you from the trouble of not knowing what to wear every morning, right? Well, you should definitely make advantage of that fact by layering your white shirt with a Cami and look like a 90’s star, or a slip dress. Either way, you will look fantastic. 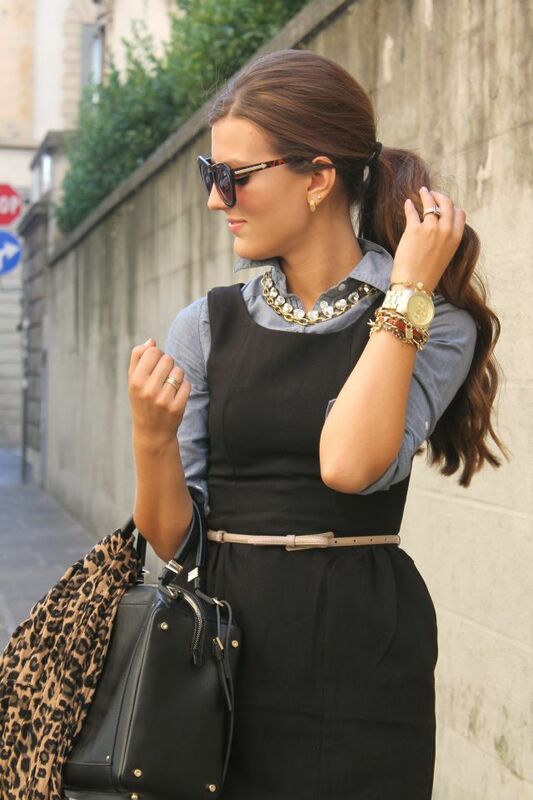 You have got a lot of styles that you can mix up together to create a nice outfit for work that will make you look fabulous and feel great about yourself too. Just stimulate your creativity and you will definitely look amazing.